Wireless sensor networks are used today in a variety of low-power applications, from wearable healthcare to water quality monitoring. These networks include a series of sensors that measure and record physical conditions — often intermittently, over a period of time — at various locations. Through a wireless link, each sensor communicates the information it obtains to other sensors in the network as well as a base location that records the readings from all of the sensors. One of the biggest challenges in developing wireless sensor networks is balancing energy consumption with efficiency. Battery life in sensors is often limited, making these devices more expensive to deploy, while reducing their number of applications. That’s where energy harvesting comes into play. In this process, energy is gathered from an external source (e.g., solar or thermal power) and converted into usable energy. Energy harvesting is beneficial, as it makes use of energy that would have otherwise been lost, helping to optimize the power of devices while extending their operational lifetime. As previously referenced, energy can be harvested from the environment in a number of ways. One example is when mechanical strain is converted into electrical energy, also known as piezoelectric energy harvesting. A potential source of mechanical strain is local variations in acceleration. This is the case when a wireless sensor is mounted on a piece of machinery that is vibrating. Let’s analyze such an energy harvester configuration in COMSOL Multiphysics. The Piezoelectric Energy Harvester tutorial model is designed to represent a simple “seismic” energy harvester. The device features a piezoelectric biomorph clamped at one end of the vibrating machinery and a proof mass mounted on the other end. A ground electrode is embedded within the biomorph, with two electrodes on the cantilever beam’s exterior surfaces. This design scheme ensures that an equal voltage is induced on the exterior electrodes. Geometry of a piezoelectric energy harvester. 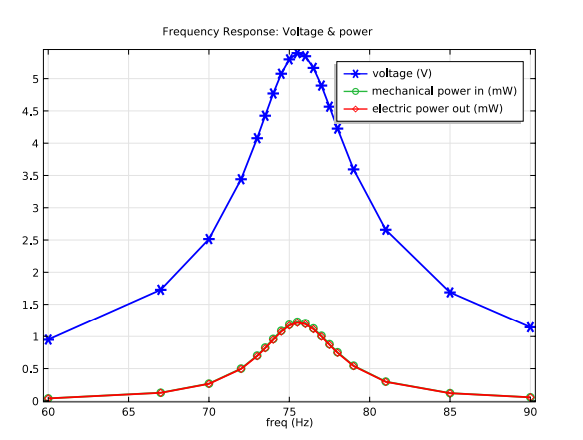 Our series of simulation analyses begins with addressing the power output as a function of vibration frequency. 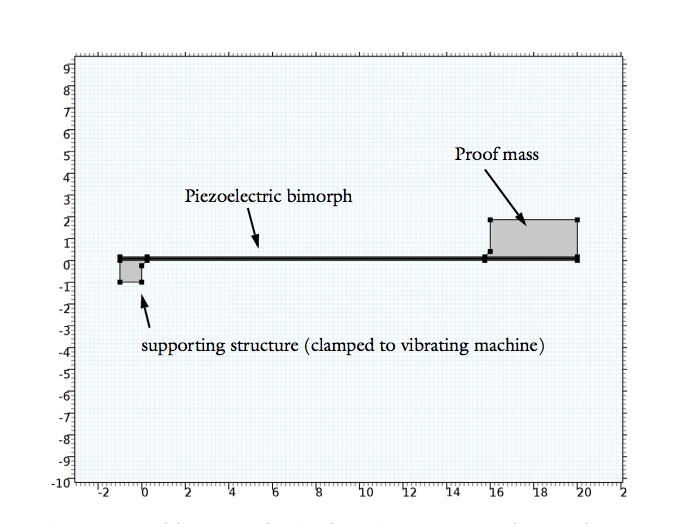 The plot below shows the input mechanical power and the power harvested, along with the voltage that is induced across the piezoelectric biomorph when acceleration occurs. In this case, the fixed electrical load is 12 kΩ and the acceleration magnitude is 1 g. From the results, we can identify a peak voltage at 76 Hz. This calculation is close to the resonant frequency computed for the cantilever in a separate eigenfrequency analysis (73 Hz). Power output as a function of vibration frequency. Let’s now measure the power output as a function of the electrical load resistance. In this scenario, we apply an acceleration of 1 g vibrating at 75.5 Hz. The results, shown in the following graph, indicate that the peak of power harvested correlates to an electrical load of 6 kΩ. 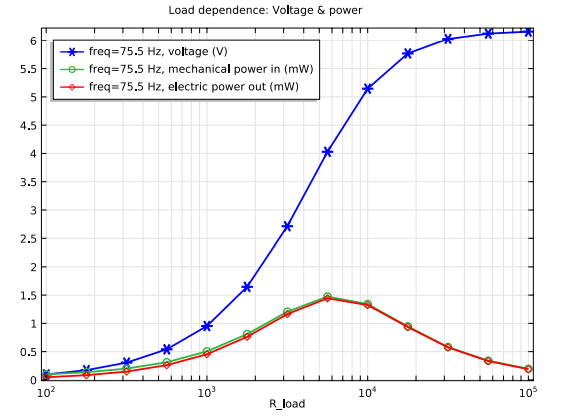 Power output as a function of electrical load resistance. 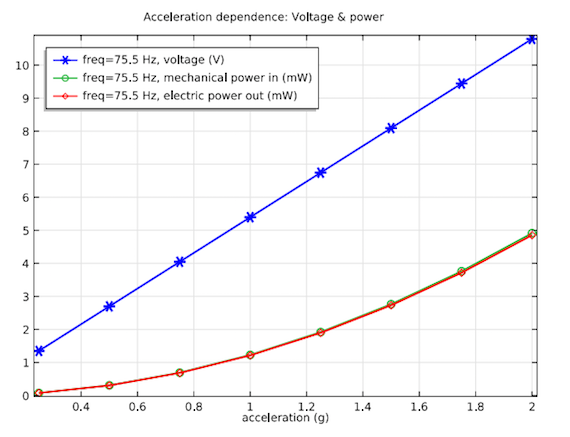 Lastly, we analyze the voltage and mechanical/electrical power as a function of mechanical acceleration. Here, the acceleration is set at 75.5 Hz, with a load impedance of 12 kΩ. As the plot below illustrates, there is a linear relationship between the voltage and the load, while the harvested energy increases quadratically. Power output as a function of acceleration. These results show good qualitative agreement when compared with experimental findings. 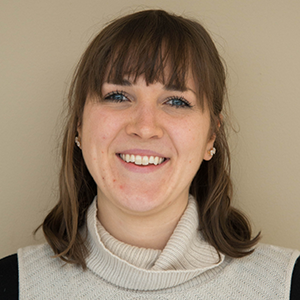 Simulation offers a simplified approach to studying and optimizing energy harvesting devices. The ability to easily test different device configurations accelerates the design process, while helping to produce more efficient energy harvesters. As the efficiency of these devices continues to grow, a greater number of technologies will have the chance to benefit from energy harvesting. what the difference will be in modeling if I want to simulate PZT cantilever based 3D energy harvester like 2D application given in this application gallery ? what the difference will be in modeling if I want to simulate PZT cantilever based 3D energy harvester like 2D application given in application gallery ? Thank you for your nice topic. I am wondering how do you calculate the mechanical power as input of the PEH. Could you please explain a little bit about your calculus? Thank you for the comments. The mechanical power is computed by cycle averaging the product of the body force and the velocity fields. You can download the model and the PDF documentation from the link above (under the section titled “Next Steps”). Mine research work i similar to this one. But i have used 3D model and point load. 1.There is an Acceleration Dependency study mode, under this Auxiliary Sweep is used with range of 0.25 to 2. Does this is an amplitude of an particular frequency? 3. You have used some expressions for ploting of Global Data, Is there any way to express the expressions without equations. 4. You have choose top and bottom of PZT as an Terminal and Ground, Why we can’t choose the sides of PZT as an terminal and Ground. I have something like your application, but I don’t know how to plot the output power , can you help me ? I did this case recently, there are some questions about that, for example, in this case, the connection is in parallel, so what should i do if i want to connect with serial ? thanks you!